The 2013 Digital Humanities conference in Nebraska just released its program with a list of papers and participants. As some readers may recall, when the initial round of reviews went out for the conference, I tried my hand at analyzing submissions to DH2013. Now that the schedule has been released, the data available puts us in a unique position to compare proposed against accepted submissions, thus potentially revealing how what research is being done compares with what research the DH community (through reviews) finds good or interesting. In my last post, I showed that literary studies and data/text mining submissions were at the top of the list; only half as many studies were historical rather than literary. Archive work and visualizations were also near the top of the list, above multimedia, web, and content analyses, though each of those were high as well. A keyword analysis showed that while Visualization wasn’t necessarily at the top of the list, it was the most central concept connecting the rest of the conference together. Nobody knows (and few care) what DH really means; however, these analyses present the factors that bind together those who call themselves digital humanists and submit to its main conference. The post below explores to what extent submissions and acceptances align. I preserve anonymity wherever possible, as submitting authors did not do so with the expectation that turned down submission data would be public. It’s worth starting out with a few basic acceptance summary statistics. As I don’t have access to poster data yet, nor do I have access to withdrawals, I can’t calculate the full acceptance rate, but there are a few numbers worth mentioning. Just take all of the percentages as a lower bounds, where withdrawals or posters might make the acceptance rate higher. Of the 144 long papers submitted, 66.6% of them (96) were accepted, although only 57.6% (83) were accepted as long papers; another 13 were accepted as short papers instead. Half of the submitted panels were accepted, although curiously, one of the panels was accepted instead as a long paper. For short papers, only 55.9% of those submitted were accepted. There were 66 poster submissions, but I do not know how many of those were accepted, or how many other submissions were accepted as posters instead. In all, excluding posters, 60.9% of submitted proposals were accepted. More long papers than short papers were submitted, but roughly equal numbers of both were accepted. People who were turned down should feel comforted by the fact that they faced some stiff competition. As with most quantitative analyses, the interesting bits come more when comparing internal data than when looking at everything in aggregate. The first three graphs do just that, and are in fact the same data, but ordered differently. When authors submitted their papers to the conference, they could pick any number of keywords from a controlled vocabulary. Looking at how many times each keyword was submitted with a paper (Figure 1) can give us a basic sense of what people are doing in the digital humanities. From Figure 1 we see (again, as a version of this viz appeared in the last post) that “Literary Studies” and “Text Mining” are the most popular keywords among those who submitted to DH2013; the rest you can see for yourself. The total height of the bar (red + yellow) represents the number of total submissions to the conference. Figure 2 shows the same data as Figure 1, but sorted by acceptance rates rather than the total number of submissions. As before, because we don’t know about poster acceptance rates or withdrawals, you should take these data with a grain of salt, but assuming a fairly uniform withdrawal/poster rate, we can still make some basic observations. It’s also worth pointing out that the fewer overall submissions to the conference with a certain keyword, the less statistically meaningful the acceptance rate; with only one submission, whether or not it’s accepted could as much be due to chance as due to some trend in the minds of DH reviewers. With those caveats in mind, Figure 2 can be explored. One thing that immediately pops out is that “Literary Studies” and “Text Mining” both have higher than average acceptance rates, suggesting that not only are a lot of DHers doing that kind of research; that kind of research is still interesting enough that a large portion of it is getting accepted, as well. Contrast this with the topic of “Visualization,” whose acceptance rate is closer to 40%, significantly fewer than the average acceptance rate of 60%. Perhaps this means that most reviewers thought visualizations worked better as posters, the data for which we do not have, or perhaps it means that the relatively low barrier to entry on visualizations and their ensuing proliferation make them more fun to do than interesting to read or review. “Digitisation – Theory and Practice” has a nearly 60% acceptance rate, yet “Digitisation; Resource Creation; and Discovery” has around 40%, suggesting that perhaps reviewers are more interested in discussions about digitisation than the actual projects themselves, even though far more “Digitisation; Resource Creation; and Discovery” papers were submitted than “”Digitisation – Theory and Practice.” The imbalance between what was submitted and what was accepted on that front is particularly telling, and worth a more in-depth exploration by those who are closer to the subject. Also tucked at the bottom of the acceptance rate list are three related keywords “Digital Humanities – Institutional Support, “Digital Humanities – Facilities,” & “Glam: Galleries; Libraries; Archives; Museums,” each with a 25% acceptance rate. It’s clear the reviewers were not nearly as interested in digital humanities infrastructure as they were in digital humanities research. As I’ve noted a few times before, “Historical Studies” is also not well-represented, with both a lower acceptance rate than average and a lower submission rate than average. Modern digital humanities, at least as it is represented by this conference, appears far more literary than historical. Figure 3, once again, has the same data as Figures 2 and 1, but is this time sorted simply by accepted papers and panels. 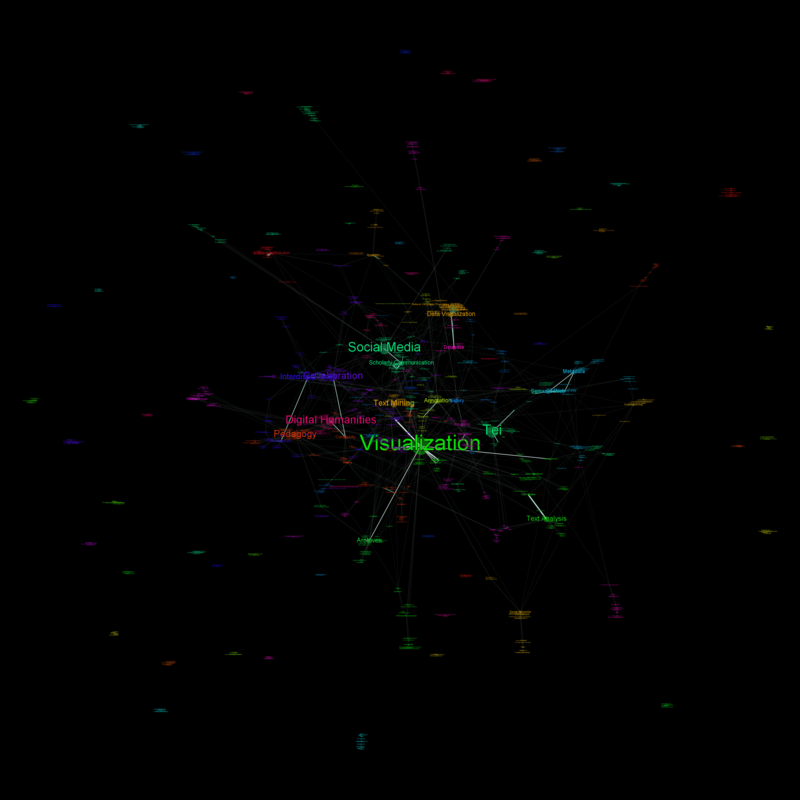 This is the front face of DH2013; the landscape of the conference (and by proxy the discipline) as seen by those attending. While this reorientation of the graph doesn’t show us much we haven’t already seen, it does emphasize the oddly low acceptance rates of infrastructural submissions (facilities, libraries, museums, institutions, etc.) While visualization acceptance rates were a bit low, attendees of the conference will still see a great number of them, because the initial submission rate was so high. Conference goers will see that DH maintains a heavy focus on the many aspects of text: its analysis, its preservation, its interfaces, and so forth. The web also appears well-represented, both in the study of it and development on it. Metadata is perhaps not as strong a focus as it once was (historical DH conference analysis would help in confirming this speculation on my part), and reflexivity, while high (nearly 20 “Digital Humanities – Nature and Significance” submissions), is far from overwhelming. A few dozen papers will be presented on multimedia beyond simple text – a small but not insignificant subgroup. Fewer still are papers on maps, stylometry, or medieval studies, three subgroups I imagine once had greater representation. They currently each show about the same force as gender studies, which had a surprisingly high acceptance rate of 85% and is likely up-and-coming in the DH world. Pedagogy was much better represented in submissions than acceptances, and a newcomer to the field coming to the conference for the first time would be forgiven in thinking pedagogy was less of an important subject in DH than veterans might think it is. As what’s written so far is already a giant wall of text, I’ll go ahead and leave it at this for now. When next I have some time I’ll start analyzing some networks of keywords and titles to find which keywords tend to be used together, and whatever other interesting things might pop up. Suggestions and requests, as always, are welcome. Great stuff, Scott! Thanks for doing this. What you say about the low rate of papers about humanities infrastructure is particularly interesting, as is your point that discussions *about* digitization seem more important than discussions of projects. I do wonder if that last is a newish development; I haven’t been to DH since 2009, I think, but back then and in the years before I remember thinking that DH (or ACH-ALLC as it once was) was a conference that relied a lot more on case studies, i.e., discussions of specific projects rather than overall principles, than I was used to. At MLA and so on it was common for people to make large claims about the significance of their work, or to frame their work as one part of a larger theoretical debate, whereas at DH I saw a lot more “here’s what we did” type stuff. What a fascinating analysis! I wonder whether there’s a way of probing the keyword choices a bit further. While I can imagine ways of describing the distinction between “DH – Theory and Practice”, “DH – Nature and Significance”, and “Digitization – Resource Creation and Discovery”, these categories seem sufficiently close/overlapping that I imagine different authors might assign the same work differently. It would be interesting to take the papers tagged with those three keywords and see whether the abstracts do differ significantly and if so how. I’ve been going to the conference since 1994 and I don’t see any drop-off in the emphasis on project development–both the papers that theorize the field and its practices, and those that describe specific project work, seem to me to be equally grounded in what we might term “making”. However, I think (very impressionistically!!) I have seen a decline in the depth of practical engagement (measured very roughly by how far down the stack the presenter’s knowledge goes, or how far down the stack the presenter thinks there is DH-relevant stuff going on) that undergirds theoretical statements. In other words, the availability of tools like WordPress and Omeka, which we could almost think of as “authoring platforms” rather than “building platforms”, means that some of the “making” is not perhaps as strongly or deeply “made” as formerly when even a simple digital publication entailed a certain degree of “OMG, it actually works!” and a very direct exposure to the data modeling and technical choices involved. While I completely agree with you that a shift *away* from making would be worrisome for DH, I honestly think that the ongoing challenge for the field is to find a balance point where all the making we do is presented in an enlightening way. I see an ongoing phenomenon with conference presentations about excellent projects that still don’t do three things I think of as essential: 1. contextualize your project (i.e. know something about other projects and say how what you did is different and why); 2. historicize your project (i.e. know something about the history of the tools and methods you’re using and say how what you did builds on something or is completely novel); 3. theorize your project (i.e. know something about the intellectual implications of the design choices you made, or the theoretical context in which your project’s significance can be understood). And I think perhaps an author who has done some or all of those things might well choose the “Theory and Practice” keyword rather than the “Resource Creation and Discovery” keyword–thereby making it look as if they were doing theory rather than “making”, whereas in fact I’d argue that on the contrary they are doing the making and *also* taking it an important step further. Long hobbyhorse and not at all sure I’m right, but I really enjoyed your post. This is a great post, with a lot of fascinating detail. The basic imbalance between literary and historical topics is striking. I wonder to what extent this echoes an imbalance in the sheer size of ordinary departments. Logically, History depts should be larger than lit depts (or so I feel, anyway, since literature is only a tiny slice of human history). But in practice I think there’s a surprising disparity in the other direction. Ben Schmidt’s enrollment figures seemed to suggest that lit/lang majors outnumber history majors by at least a 2-1 ratio. If that’s true, the lit/history imbalance in DH might mostly be echoing the broader structure of academe. Not that I mean to defend the imbalance at all — see my parenthesis above!